Did you know El Palmar Beach & Tennis Resort has mountain bikes onsite for our guests? 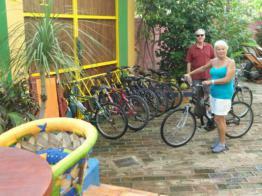 They are great for exploring Melaque or if you just want to hop on one and make a cerveza run! Our little seaside village is perfect for exploring by bike, lots of paved roads, slow moving cars and flat straightaway's make biking a relaxing pastime during your Mexican vacation. At the beginning of each vacation season our local bike mechanic, Jose Alfredo Sanchez Raya, tunes and refurbishes our fleet to ensure brakes, sprockets, and cables are in working order. 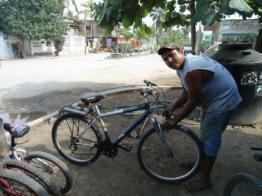 Living on the beach can be hard on bikes but thanks to Jose, all our bikes are maintained and ready for our guests. Come explore Melaque on your Mexico vacation. We've been coming to El Palmar for many years now and it never disappoints.